Sometimes, when life gets a little hectic, it's easy to let your yoga practice go by the wayside. But even 10-minutes of yoga can make a world of difference when you feel like you don't have time for your practice. So here is a 10-minute sequence I like to do when I'm looking for a little extra strength and flexibility in my day. You can take any asana to any stage that is good for you, and always remember to breathe and check in with how you’re feeling. Each Asana should be held for 3-5 breaths. Beginning in a Table Top position, bring the big toes together as the knees spread as wide as your mat. Allow the sitz bones to reach towards the heels, as the hands walk forward away from the body. If you need a deeper stretch in the shoulders, walk the hands forward and pull the earth towards you with the hands. Rest the head on the floor, while the arms remain elevated alongside the ears. Inhale to lift the head and torso; exhale walk your hands to the left, allowing the left arm to reach further. Coming to a comfortable stretch you can hold, allow the forehead to rest as you pull the earth towards you. Hold for 3 breaths, inhale rise to center, and exhale to the right, allowing the right arm to reach further. Hold for 3 breaths. Inhaling back up into a Table Top position, shoulders stacked over wrists, knees under hips, and triceps engaging away from the body (external rotation), inhale and allow the belly to drop as the chest and hips gesture towards the ceiling, with the gaze straight ahead. Exhale, rounding the spine, tucking chin to chest, pushing the earth away from you with 4 planted points (hands and knees). Repeat this as you move with each inhale and exhale. Take about 10 or more rounds of these to assist in finding movement and a release in the spine. It's always important to get our spines moving first! Coming from a Table Top position, with the hands below the shoulders and knees below the hips, walk the hands slightly forward of the shoulders and spread the fingers wide. 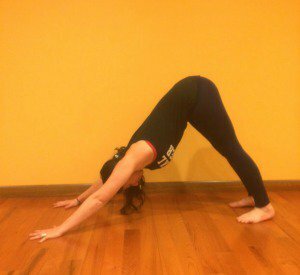 Lengthen through the back of the neck, curling all ten toes under, and exhale as you press your hips up and back into a bent knee Downward Facing Dog Pose. 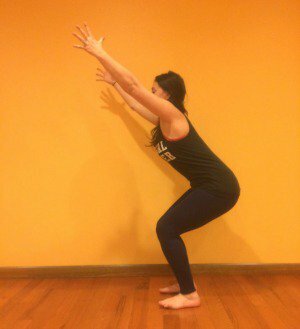 Press through the hands as you elongate through the spine and hips. Hug the shoulder blades onto the back and root down through the thumb and index finger. Bending one knee and then the other. Rising onto the tips of the toes then rooting down through the legs. Shaking the hips side to side. Walking, hopping, or jumping to the front of your mat, come into a Forward Fold. Bring the big toes together or have the legs hip distance apart to prepare for Utkatasana, or Chair Pose. Bend the knees so the torso lies across the thighs as you push the earth away from you with your feet. Allow your weight to equally distribute through both legs, putting a little more weight into the heels, while keeping the knees bent and abdominals in. Allow the torso to rise as the lower body sits into Utkatasana. Arms can raise alongside the ears, or you can keep the hands at heart center or at the hips. Find energy throughout the abductors and adductors (outer and inner thighs), a downward extension of the gluteus, and bring the abdominals into the center body. Make sure there is no arch in the lower back. With the knees bent and feet planted close to the sitting bones, find a tall seat and wrap the hands around the thighs. Now bring the hands behind the thighs, lifting up onto the toes so that you rock slightly back on the sitting bones. Lengthening up and out of the lower back, lift the head and engage the bhandas. 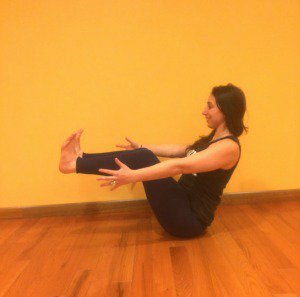 Next, extend the shins so that they are parallel to the floor and extend the arms into Navasana. To deepen this pose, straighten the legs, and squeeze them together, pressing through the big toe mounds of the feet. Extend out through the arms and breathe. Another variation you can try is to bend the knees and wrap the peace fingers around the big toes (Shanti Mudra), before extending the legs. Don't forget to end with a five minute Savasana! How do you work yoga into your daily life? Which poses are your favorite to practice every day? Share with us in the comments below!